Railpictures.ca - A.W.Mooney Photo: Getting a decent photograph of any train climbing the escarpment from Hamilton to Vinemount is always difficult. But still worth a try. I’m not exactly sure where along the ridge I shot this from but I have a feeling it is just west of DeWitt Rd in the Creek. I doubt there is a single building lot left down at the bottom of the hill, either. In the misty background once can see the beach strip and Burlington on the far side. Power on what I have listed as a rock train is TH&B 72, 73, 57, 51 and 55. Upon cresting the escarpment, TH&B 55 was cut off and returned down into the city. The train itself was probably going to Port Maitland. | Railpictures.ca – Canadian Railway Photography – photographie ferroviaire Canadienne. 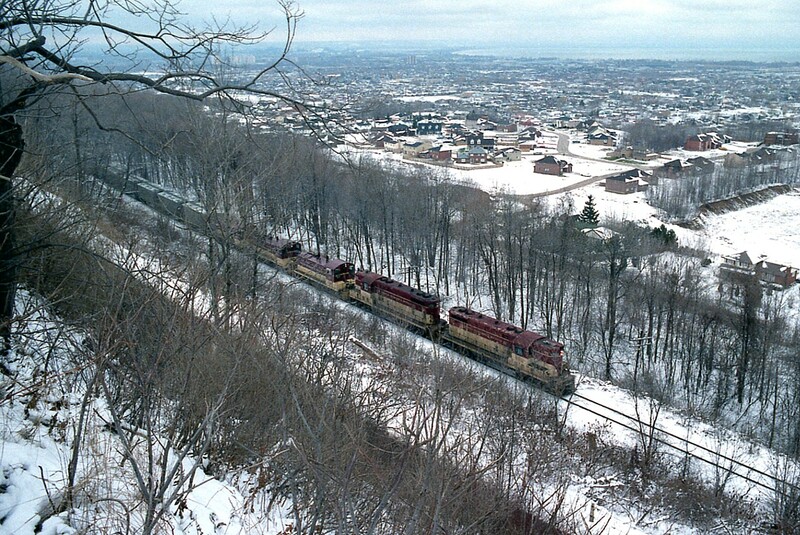 Caption: Getting a decent photograph of any train climbing the escarpment from Hamilton to Vinemount is always difficult. But still worth a try. I'm not exactly sure where along the ridge I shot this from but I have a feeling it is just west of DeWitt Rd in the Creek. I doubt there is a single building lot left down at the bottom of the hill, either. In the misty background once can see the beach strip and Burlington on the far side. Power on what I have listed as a rock train is TH&B 72, 73, 57, 51 and 55. Upon cresting the escarpment, TH&B 55 was cut off and returned down into the city. The train itself was probably going to Port Maitland. Thanks for the compliment. Oh how I wish I could live those years over, except for the ‘working’ part, of course. Great times for trains. Now? Meh….for the most part. Geez, what great mapping. Thanks for the link! I never seem to find these things myself. Trees grow quick.. and if I was to do this differently I’d have stood on top of my vehicle to get above the vines a bit more.. and i’d love to ask property owner to clear a shot for us but alas.. There has got to be some sort of shot around that DeWitt Rd crossing.remember it is one way up from the bottom though. Even up top at Vinemount isn’t much of an image any more, but if you go about4 or 5 houses to the left there is a nice shot this time of the year with the lake as a backdrop. Very cool. Checked out Vinemount today just wandering about, and wondered if a shot like this was possible somewhere. Can’t believe I don’t remember this from just a few months ago – maybe it was somewhere in the subconscious. Your location is correct, that’s the ‘plateau’ as we creekers called it, had many friends live up there – the ‘rich’ part of town really.